Gridworks convenes and supports stakeholders working to achieve greater benefits for West Coast consumers as the resource mix on the western grid evolves to include a higher percentage of renewable resources. This initiative builds on the Western Public Utility Commissions’ Joint Action Framework on Climate Change, signed by the Chairs of the California Public Utilities Commission (CPUC), the Oregon Public Utility Commission (OPUC) and the Washington Utilities Transportation Commission (UTC), to support ongoing cooperation to reduce greenhouse gas pollution, improve reliability, and obtain cost benefits for ratepayers. Gridworks publications contributing to the Pacific states’ resource planning is now available. Senior Fellow Mike Florio’s report, “Sharing Power Among the Pacific States“, was released January 2018. Join us February 12th for a webinar discussing the paper. 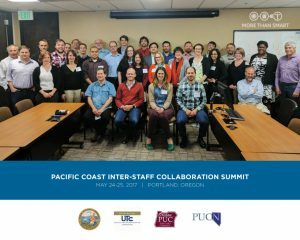 Sharing Power: A Workshop to Promote Low Carbon Electricity between the Pacific Northwest and California. Gridworks is hosting a workshop in Portland on increased capabilities for transfers of low-carbon electricity between the Pacific Northwest and California. The workshop will identify areas where increased cooperation and development of shared information could improve reliability, reduce costs, and/or reduce GHG emissions between California, Oregon, and Washington. Funding to host this event is being provided by the William and Flora Hewlett Foundation and the Energy Foundation. modeling of resource availability for energy and shaping. Council’s modeling capabilities of the NW hydro system and data. Resource planning and the relationship between energy and capacity. Climate change impacts on availability. Operations of and constraints on the NW hydro system. All participants encouraged to offer their input and suggestions for maximizing the value of the study. Discussion questions to be circulated in advance.